Podcasts have been around for more than 10 years, but I only discovered them last summer. Better late than never, right? I should revise that and say, I knew what they were or at least I thought I did. I also thought that I wouldn’t be interested in them. Boy, was I wrong. I’m a podcast addict now and look forward to my favourites in the same way I do for the TV shows I love. Folks, there is a whole other world out there in podcast land. If you aren’t listening, you are missing out on some good stuff. The story of how I started listening to them is a bit mundane. Basically, I was looking through the apps that came with my new iPhone 6 Plus and tapped the little Podcasts icon to see what it was all about. I looked at the podcasts at the top of the charts and randomly clicked one to listen to. I was shocked that it was actually interesting and I thought to myself that I needed to find more podcasts. I started listening to them in bed to wind down after a long day. It’s become part of my daily routine and an activity I’m thoroughly enjoying. Once people find out that I like listening to podcasts, we’ll swap our recommendations. I figured I’d take it to the next level and post about my favourites. 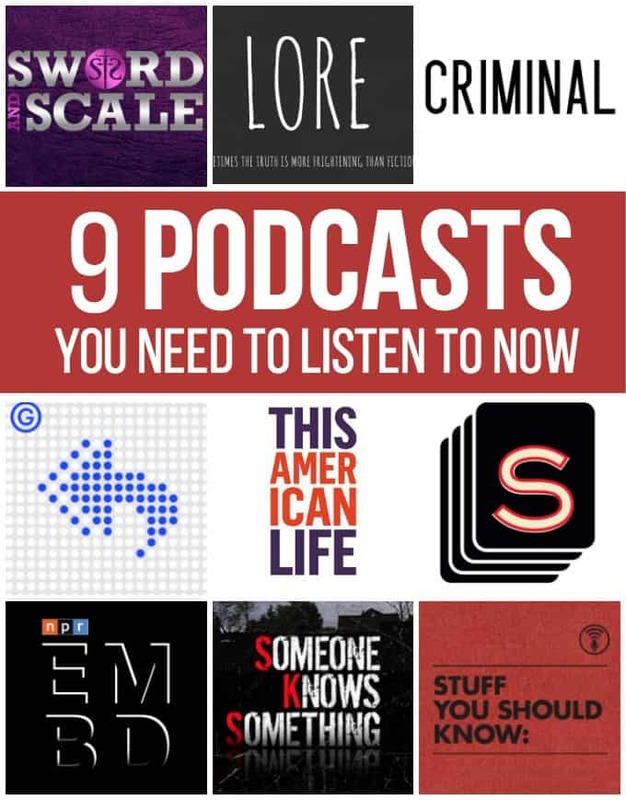 Here are 9 podcasts you need to listen to right now. These are the ones I stalk for new podcast episodes daily on my phone! 1. Someone Knows Something. Right now, this podcast is my #1. It’s not only Canadian, but it happened in my neck of the woods. In 1972, 5 year old Adrien McNaughton disappeared from a family fishing trip on Holmes Lake near Calabogie, Ontario. David Ridgen, the podcast host, grew up in the area and goes back to investigate what happened. Adrien disappeared 6 years before I was born and even though I’m from the same area, I’d never heard about the case until now. The scary thing is that he disappeared without a trace. No body was ever found. Nothing at all. It’s a cold case mystery. I hope if “someone knows something” that they come forward so this family can finally have answers. 2. Embedded. This podcast takes a news story and goes deep; What I mean here is that they take you right to the scene and immerse you into the story. For instance, I listened to a recent podcast episode about the gangs of El Salvador and how they were paralyzing the country. Another one was about a town in Indiana where there is a real issue with prescription opoid addictions. The host, Kelly McEvers, goes right to where the story is taking place to tell us about it. 3. Sword and Scale. “Sometimes the worst monsters are real.” That opening line on every Sword and Scale podcast pretty much sums it up. This podcast is all about true crime. Each podcast features a different “ripped from the headlines” type of story although sometimes, show host, Mike Boudet, does two part-ers if it’s a particularly complex case. You’ll hear everything from 911 calls, court testimony, interviews with the victims and sometimes the perpetrators. It’s fascinating and disturbing at the same time and not for the faint of heart. I binge listened to all the podcast episodes to date before Christmas. They release a new podcast around every 2 weeks. 4. Criminal. Phoebe Judge hosts this true crime podcast. It’s described as “stories of people who’ve done wrong, been wronged, or gotten caught somewhere in the middle.” The podcasts I’ve listened to so far featured people and crimes that I had never even heard of before. For instance, they had a recent podcast about Jolly Jane, a nurse from the 1800’s who poisoned her victims with a smile. Then there was the one about the Treaty Oak, a historic tree in Austin, TX, and who was behind trying to kill it. 5. Reply All. This podcast is all about technology and the Internet. At first glance, it sounds like it will be a dry subject, but it’s actually fascinating. One noteworthy podcast episode looked at why it was so hard to get Fios, Verizon’s fibre optic Internet, in New York City. 6. Lore. “Sometimes the truth is more frightening than fiction.” Listening to Lore reminds me of sitting around a campfire and telling spooky tales. The stories are based on various legends from history and most of them I’d never even heard before. It’s a little bit history, a little bit thriller and a whole lot entertaining. 7. This American Life. This podcast was one of the first ones I started listening to. Each episode has a theme with a variety of stories shared. It’s interesting, diverse and engaging. This page shows a sampling of some popular podcast episodes to give you a better idea of what you can expect. 8. Serial. When I asked on my Facebook profile about everyone’s favourite podcast, most of the people said Serial. It’s hugely popular and for good reason. It’s a great podcast! Each season shares ONE true story and we follow along with the narrator as she dives deep into what happened. Season 1 is about the murder of high school student, Hae Min Lee, in 1999 and the arrest of her boyfriend, Adnan Syed, for her murder. He says he is innocent, but is he? They are currently sharing Season 2 with a new true story. 9. Stuff You Should Know. But don’t. They take a random topic each podcast episode in depth in an entertaining, interesting and sometimes, humourous way. I don’t listen to every one because they have a TON, but choose the topics that intrigue me. Check out the diverse range of subjects. If you are the type of person who enjoys learning or has a passion for trivia, this is a great podcast to listen to. Do you listen to podcasts? If so, what are your favourites?